A FREE mini e-book for people who want to stop feeling overwhelmed with dietary changes and start feeling more vibrant, lighter, and more in-line with their values. If you’re ready to eat more plant-based foods but don’t know how to get past the heaps of information and logistical challenges of fitting it into your every day life, this mini e-book is for you. The most important tool, and ingredients, to keep on hand for food prep -especially helpful to those living busy lives! 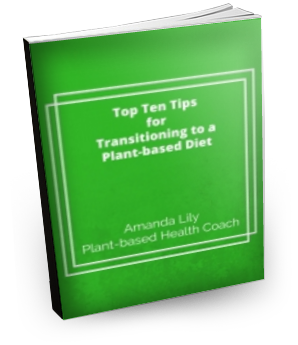 For your FREE “Top Ten Tips to Transitioning to a Plant-based Diet” mini e-book, enter your name and email address below. Yes! Send Me the Tips! Thank you! Check your inbox for an email confirmation. After you have confirmed your submission you will receive your mini e-book within 24 hours. You’ll also be subscribed to my newsletter. You can unsubscribe anytime and your information is kept confidential. Check your inbox for an email confirmation. After you have confirmed your subscription you will receive your mini e-book within 24 hours.